Jack and the Baby Talk: Have You Seen My Weaner? One of the hippie things the Wifey wanted to accomplish with the Baby was her belief in “baby led weaning”. The concept is simple, introduce solids to the Baby around six months, and let the Baby figure it out. You have to totally disregard baby food feeding and allow the baby to utilize her natural instinct in eating. The theory behind it is that if a baby is constantly spoon fed, the baby won’t realize when she’s full and where her gag reflexes is located. The parents will just continue to shovel food into a baby’s mouth until the jar is empty. Most people don’t realize that babies come in different sizes and have different appetites. Just because you scoop the last gunk out of a baby food jar and playfully say “it’s all gone!” doesn’t mean your baby is full. Obviously there are other things involved in order to make baby led weaning successful and the most important one is supervision. We never gave the Baby a chicken leg and said go to town. We started off slow and soft. The Baby’s first foods were smashed up avocados and bananas. We laid the food in front of her and let her grab it herself and attempt to put it in her mouth. The first experience did not go over so well. But eventually she figured it out. It was around this time that her first tooth popped out so decided it would be a good time to present her with the best stuff on Earth: MEAT! The Baby actually had a piece of steak. The Wifey and I both just stared at her just in case anything would happen and she ate the whole piece of steak. It was quite impressive. The Baby would utilize a combination of her tooth, saliva, and just sucking on the food to eventually break it down. She knows not to shove the whole thing in her mouth or she will start to gag which in turn tells her to stop. For some odd reason, she likes to gag herself with her own fingers, seems like we have a future gymnast! Another big issue is the actual messiness of baby led weaning. I’ll be honest, it’s pretty messy but it’s an adorable, cute messy. The Baby had to learn the hand eye coordination to get the food in her mouth and so the baby ends up painting her face with food. But over time she has gotten really good at it. We usually don’t even have to wipe her face after she eats, but the mess on the floor is another story. Baby led weaning has given the Baby the ability of choice and if she doesn’t choose something she likes, she throws it on the ground. 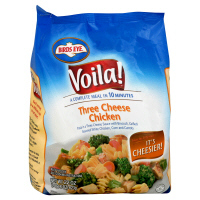 Since we usually feed her whatever we’re eating, there are always corn kernels, pasta, peas, and everything you find in my wife’s best dish, Voila. There are also other “milestones” that need to be reached before baby led weaning can be introduced. A major one is the establishment of the “pincher” grasp, which usually occurs around six months. The baby needs to be able to grasp with the index finger and thumb and actually take the food. Otherwise you’ll just have baby palm smashed food smeared across the table and nothing near the mouth. 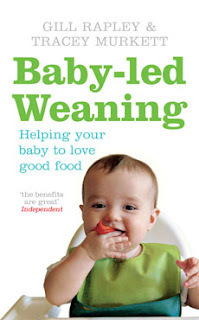 If you really think about baby led weaning, it all makes sense. What did parents do prior to jarred baby food? Despite the fact that we think of little babies as cute and helpless, they are designed to be resilient and have an innate ability to be adaptive. There is nothing wrong with jarred baby food; it’s easy, convenient, and very clean. The only downside to baby led weaning is the fact that I have no excuse not to share my food with the Baby and it doesn’t help that she loves steak so much. I am really excited to start this soon with Piper. I think we are going to start putting food in front of her in a couple weeks and just see what she does with it. She has been grabbing toys and bringing them to her mouth for a few weeks now, but just this week she has started reaching out towards almost anything, especially if its in our hands so I think she'll be interested enough to try it. Haha I die at your "future gymnast" comment! We love BLW over here. My husband especially is a big fan and we love giving Sebastian (9 months) the table foods we are enjoying. BLW *is* messy, but once you get a rhythm, cleaning up after baby is pretty easy.